My sugar addiction is well documented. 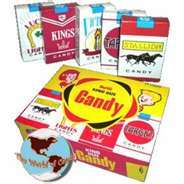 I would also buy candy cigarettes and Fresca (because Fresca looked like a beer can). I’m sure I convinced all my neighbors that little 9-year-old Peri was a raging alcoholic and a chain smoker. Wax bottles filled with a teensy amount of sugary liquid (might have been a sedative). Charms Sweet & Sour Pops that would make the roof of my mouth bleed. Freshen Up gum that had a squirt of something oozy in the middle (Ewww). Bottle Caps –especially the Coke flavor because my mom wouldn’t let me drink Coke. Big Hunks–a “chewy” nougat bar with nuts–responsible for pulling out at least five of my teeth. Candy necklaces that would mix with the my sweat in the summertime and turn my neck into a rainbow of pastel colors. I tried to lick my neck. Didn’t work. Razzles. Yeah, it’s supposed to be gum but I ate them like candy. Luden’s cherry cough drops–or black licorice drops. For no particular reason. Candy lipstick (to put on after I finished my candy cigarette and Fresca beer). Licorice Snaps (which I HATED but still ate). Hey, they were made of sugar. By the way, my dentist loved me. What was your childhood addiction? Is there a candy you loved? Share with me. Make me feel like I’m not the only child from the ’70s addicted to anything sugar. Well, I’m a child born in… well, the 90’s, but likewise, I have developed a similar addiction to all things made with sugary goodness. It is a kind of a house-hold problem. All of us have been conditioned to crave. Chocolate is a constant necessity. I just want candy – ALL the time. When there is no more candy in the house, I seek out the brown sugar. I didn’t realize that it was a real dependency until I offered a sister-in-law a piece of Symphony bar and she actually DECLINED! My concept of reality splintered a little. Anyway, I really enjoyed reading this and wanted to say thanks.